Having some sensory issues, my daughter gets over-stimulated by her surroundings very easily. To get some relief, she needs something to concentrate on besides all the craziness around her. I bring her iPad everywhere for this reason. But I wanted something less tech and still sensory-friendly. So with some coarse glitter, empty snow globes (Michaels Craft) and clear Karo syrup, my daughter and I created a bunch of different colored sensory glitter globes. You can buy empty snow globes for a pretty good deal on Oriental Trading OR you can grab some Aqua Balls (see below) at the gas station and they also make awesome Glitter Globes. I got the little glitter vials at Walmart in the kids craft section. 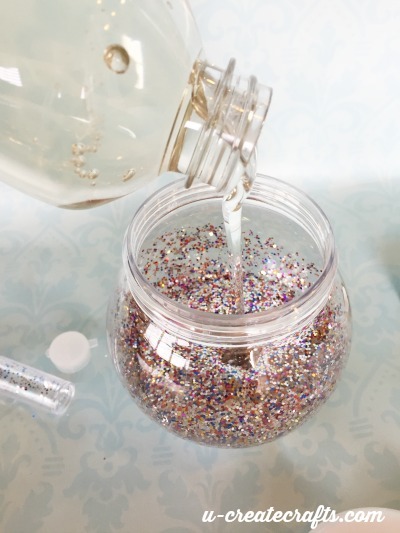 Dump a whole vial of glitter into the globe. Fill 3/4 of the globe with clear karo syrup. Fill the rest of the globe with water. Add buttons, beads, Legos, etc…basically, whatever your child likes. Use E6000 glue to seal the lid and let it sit for 24 hours while the glue dries. I tried three different types of glitter and my daughter liked the coarse glitter better because she can see it move better. The blue globe is called our Frozen Globe because it has snowflake buttons inside and they float all around. The fine embossing powder is her least favorite because it moves so slowly. 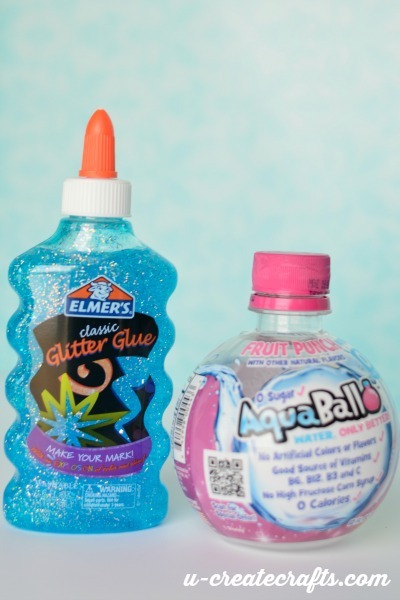 As promised, I tried the Glitter Globes with the Elmer’s Glue…this is when I happened upon the Aqua Balls. On my way home from a meeting, I stopped at the gas station to grab a Diet Coke (#addicted) and I saw these awesome round bottles. I seriously didn’t care what drink was in them, I had to have them. Luckily my kids LOVED the flavored water and I got to keep the Aqua Balls. 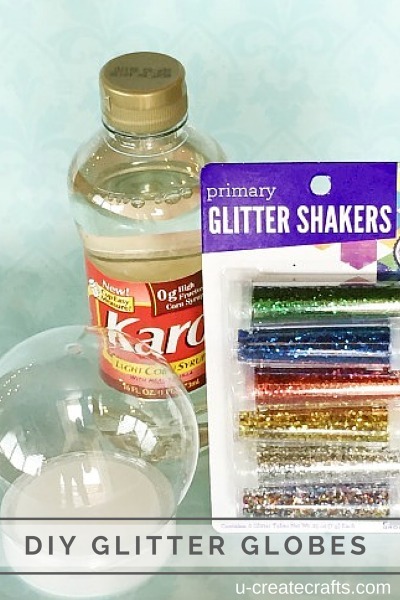 To make this version of the glitter globes, I dumped an entire bottle of the glitter glue into the empty drink bottle and filled it the rest of the way with water. For the pink glitter globe, we added buttons. For the purple glitter globe, we added half a vial of the glitter (from above)…DON’T do that. The added glitter sticks to the sides of the bottle, thanks to the “glue” part of the glitter glue. It still works just fine, but takes a lot more shaking. The end result: my daughter prefers the glitter globes with Karo syrup rather than the Elmer’s glue. Maybe I need to add more water to the ones with glitter glue to make it more liquidy. However, both ways work just fine. 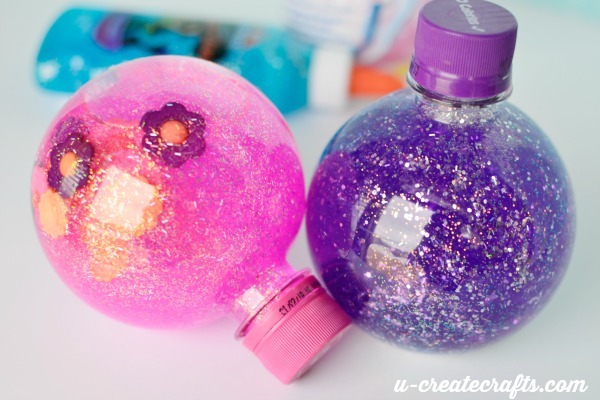 If you make some glitter globes, we would love to see what you create…share it on our Facebook page or tag us on instagram @ucreateblog. this is a very good idea for anyone. even the elderly may like them. so a perfect nursing home gift idea. make sure the bottles are all plastic . I will keep this idea in mind . got to collect these globes or bottles first. What a great idea. Thank you for commenting! What a fantastic idea! I love it!! What kid or adult for that matter wouldn’t love to play with this?! I love these! I do have a suggestion for a change or substitution… I would go with water and glycerin (you can get that in the pharmacy department at WalMart) simply because my son loved to open things to see how they work. I can just see Karo all over! Sticky! It’s going to be a bit more expensive but when you have a scientist, like mine when he was little, oh yeah. Great advice! I glued the lids on these bottles with E6000. There is no getting them off…however, I am sure a child can find a way. 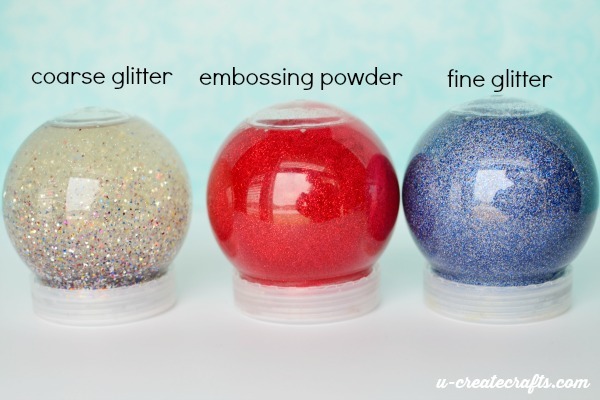 I love these glitter globes – thanks for the instructions! I see that you have a few different places listed on where to purchase the globes. Where did you get the globes in photos 1 and 3? Thanks! I bought mine at Michael’s Crafts. They only have them at Christmas. Thanks for the quick response. I’ll be dropping by Michael’s soon and trying this out! What a great idea! I have a granddaughter with sensory issues which is new to us, so we are always looking for ideas on what to do for her. I am definitely going to try this. I checked and it looks like I will be able to get the snow globes on Oriental Trading. At the risk of asking a dumb question, what is E6000 and where do you get it?